Thanko has also released Cynmate ANDBOX44, its Android powered smart TV box. If you want to enjoy various wonderful content from the Internet via your HDTV, it should be a nice solution.This is an Android powered mini PC that measures 87 x 66 x 24mm and weights 80g. As we can see from the images, the mini PC is shaped as a soap box, and embedded with a Cortex A8-Allwinner A10 1.5GHz processor, 1GB DDR3 RAM, 4GB internal storage for high performance, and using integrated HDMI output, you can easily connect the TV box with your HDTV, while the built-in Ethernet allows you stabilized access to the Internet in wired way for your favorite videos, music and other wonderful content. Apart from that, the mini computer also comes with a microSD card slot supporting 32GB and 2 USB ports, and runs on Google Android 4.0 Ice Cream Sandwich mobile operating system for easy access to Android App Market and Google Play. 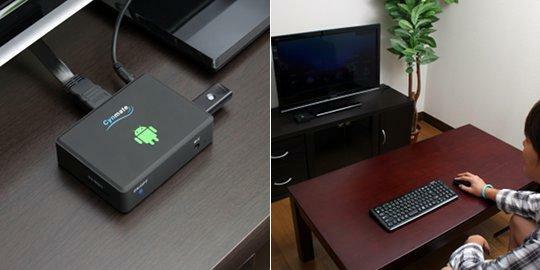 Note that the TV box doesn’t have WiFi.Thanko Cynmate ANDBOX44 Android smart TV box is priced at $157 USD. If you’re interested, jump to Japan Trend Shop for more details.